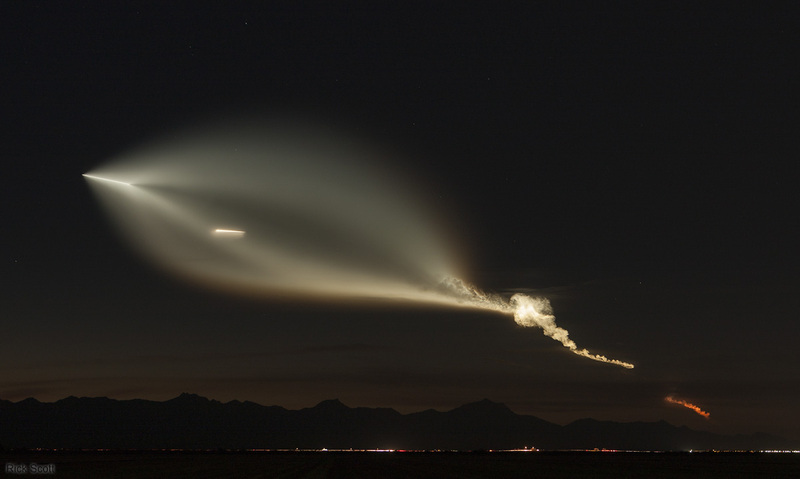 On the evening of December 22, 2017, a SpaceX Falcon 9 rocket was launched from Vandenberg AFB on the coast of California. It lit up the sky with a spectacular display visible from most of the Southwest. Not surprisingly, it triggered a lot of 911 calls about UFOs and North Korean missiles. Launches are announced ahead of time, so I and many other astronomers here in Arizona were ready to capture it on video. There were three factors converging to make this a great show: weather was predicted clear, the rocket was burning LOX and RP-1 (which makes a much more visible exhaust than LOX and H2), and the launch was scheduled to occur about an hour after sunset Arizona time, so our sky would be dark but the rocket (800 km west of here) would still be illuminated by the Sun. 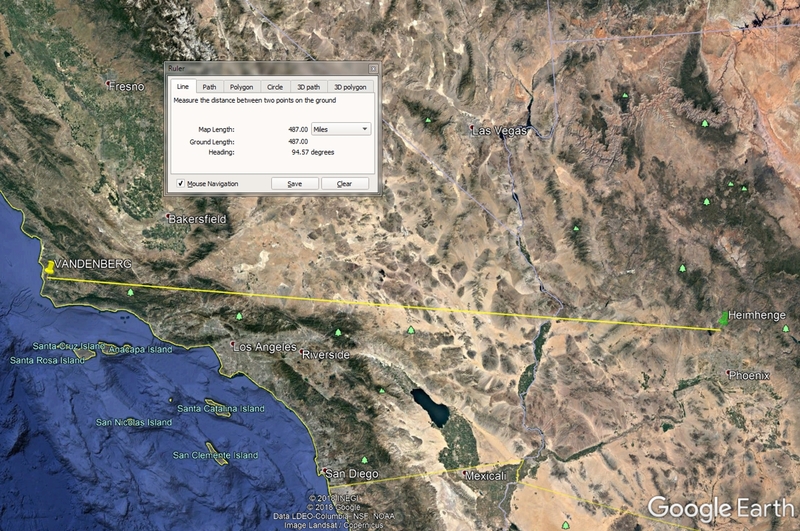 At initial appearance the Falcon 9 is already at an altitude of at least 50–60 km (in order to be seen over the curve of the Earth from my location). The 1st stage is burning rocket grade kerosene (RP-1) and liquid oxygen (LOX) through a cluster of 9 engines. This produces a thick column of exhaust that is illuminated by the Sun — the exhaust is only hot enough to make its own light directly behind the rocket. 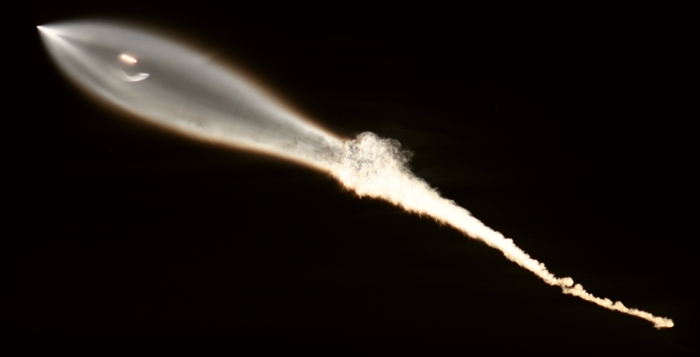 The rocket passes behind a layer of stratus clouds which briefly hides the exhaust trail. The exhaust trail momentarily disappears as the rocket throttles back preparing for stage separation. At this point its speed is around Mach 10 (3.4 km/s) at an altitude of 80–100 km. Stage 2 ignites its single engine, also burning RP-1 and LOX. The exhaust trail is seen to widen and form a larger teardrop shaped plume. Atmospheric pressure is much lower at this altitude, so exhaust gases more rapidly disperse into the ambient near-vacuum. As stage 2 continues to climb the rocket approaches the edge of the camera’s FOV (which is only around 5° x 7° through the 200 mm telephoto). I had underestimated how much of the sky this launch would span based on a launch I photographed back in 2010. This is where I had to start repositioning my camera to keep up with the rocket. In the second sequence, and beyond, you can see stage 1 become visible in the thinning plume of stage 2. Note that when stage 2 separated from stage 1, stage 1 continues to follow it for some time under its own inertia. You can see some shock waves forming in stage 2’s exhaust as it strikes the now-ballistic stage 1. In the third sequence, stage 1 reignites its engines to control its descent. This is how it would normally return to land vertically on a barge (or the ground) and be reused for another mission. In this case it was never intended to land, as the heavy payload (10 Iridium communications satellites) didn’t leave enough fuel. So stage 1 was ditched in the ocean, but SpaceX went through the entire sequence of maneuvers as if they were landing on a barge just for practice. You can see the flashes of light as they fire the engines. From there to the end of the video all you see is stage 2 continuing to climb and accelerate (with the occasional out-of-focus shadow of an ocotillo branch). 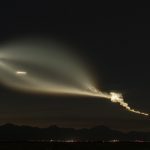 All Iridium satellites were successfully delivered to an orbital altitude of 780 km (480 miles) with a speed of Mach 25 (8.6 km/s or 19,000 mph). Next launch I’ll be using my fisheye lens, and a shorter exposure to avoid the saturation that wiped out details during earlier parts of the launch. And I’ll shorten the time lapse interval for smoother motion. I don’t have a video mode on my older-model camera, so time lapse is my only option. Others astronomers produced far better videos of this launch. And Rick Scott captured this wide-angle still image that shows stunning detail (click to enlarge). You can see more launch images, and others natural wonders, in his Natural Images Gallery. I expect to see these launches more frequently as SpaceX ramps up its operations. We are moving into the age of commercial space travel and launches for hire. SpaceX is joined in this venture by others like Virgin Galactic, Blue Origin, Bigelow, and SpaceDev. Launches just might become so commonplace that they’ll stop generating 911 calls. Maybe.